Abstract: This paper examines changes in India’s rural labour market after 1991, but mainly in the 2000s, using evidence from the Census and the National Sample Survey (NSS). The Census data show a large decline in the size of main cultivators and an increase in the size of marginal agricultural labourers in the two decades after 1991. These changes were more marked in the eastern, northern, and central- eastern States, than in the western and southern States of the country. The combined size of cultivators and agricultural labourers increased between 2001 and 2011, according to the Census. On the other hand, the NSS registered a decline in the size of the agricultural work force and an increase in rural construction jobs after the mid-2000s. The discrepancies between these two data sources are particularly striking in some States, including Bihar, Odisha, Madhya Pradesh, and Rajasthan. 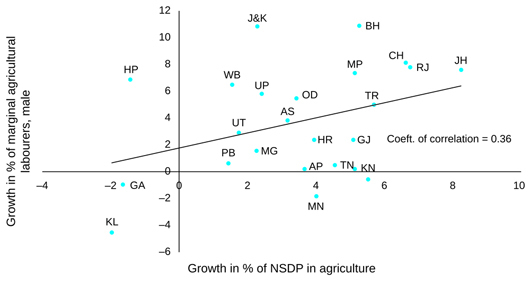 The findings of this paper suggest that a structural transformation of the work force away from agriculture is yet to begin in many parts of rural India, and that the optimism generated by the NSS data on this count is perhaps unwarranted. At the same time, the paper highlights some of the problems with India’s employment statistics, especially with regard to measuring the short-term migration of workers. Keywords: Rural labour markets, Census of India, National Sample Survey, agricultural workforce, rural construction, regions of India, India. This paper examines some aspects of the changes that occurred in India’s rural labour market after 1991, but mainly in the 2000s. The analysis here is based on data from two sources: the Economic Tables of the Census of India, and the Employment and Unemployment Surveys (EUS) of the National Sample Survey Organisation (NSSO). A study of India’s labour markets is important for a number of reasons. To begin with, there is the so-called “demographic dividend” or acceleration in growth of India’s working-age population. World Bank estimates show that India’s population in the age-group of 15 to 59 years will increase by approximately 200 million between 2010 and 2030. This is likely to lead to a sharp rise in the potential labour force of the country. It is therefore important to examine whether the demand for labour in the country is rising in line with the increase in labour supply. India today is one of the fastest growing large economies of the world. However, on the other side of the coin is the fact that recent economic growth has largely relied on partial successes in the services sector, while the agricultural and industrial sectors have suffered from many limitations. Such a pattern of growth has led to a crisis in employment creation in the country as a whole (Thomas 2012). The challenge of employment generation is more daunting in less-developed States such as Bihar and Uttar Pradesh, in the country’s eastern and northern regions, than elsewhere. The increase in the working-age population, and therefore in the potential labour force, is expected to be faster in these States. The pattern of economic and employment growth in India has implications for the structural transformation of the country’s labour force. The movement of “surplus labour” from traditional (also agricultural or informal) sectors to modern (also industrial or formal) sectors – as famously modelled by Arthur Lewis (1954) – has been an important characteristic of India’s economic development. With the surplus labour reserves getting used up, the share and absolute size of the agricultural workforce show a decline, and real wages begin to rise in the economy (Fields 2004). The East Asian “tiger” economies of Taiwan and South Korea had reached such a turning point in their development by the mid-1960s, note Fei and Ranis (1975). Some observers believe that China too is reaching a stage in which it will have little surplus labour remaining in agriculture (Xiaobo et al. 2011; Li et al. 2012). In 1983, the shares of agriculture and allied activities in India’s gross domestic product (GDP) and total employment were 35.1 per cent and 68.2 per cent respectively. By 2011–12, agriculture and allied activities accounted for a share of only 14 per cent of India’s GDP. Nevertheless, these sectors continue to employ approximately half (47.5 per cent in 2011–12) of India’s workforce, according to National Sample Survey (NSS) data (Thomas 2015). Given this context, one of the main objectives of this paper is to examine whether there are signs of a definitive movement of India’s rural workforce away from the agricultural sector. Studies using NSS data noted an absolute decline in the size of India’s agricultural work force for the first time in the second half of the 2000s. Between 2004–05 and 2011–12, the work force engaged in agriculture and allied activities in the country declined by 33.3 million, whereas employment in rural construction increased by 20.5 million. The decline of agricultural employment and rise in rural construction jobs after the mid-2000s were especially marked in some of the less-developed agricultural States of the country, such as Bihar, Uttar Pradesh, Madhya Pradesh, Rajasthan, and Odisha. Thus, the NSS data suggested that a shift of the labour force away from agriculture, on lines suggested by the Lewisian model, might have actually begun in India (Chand and Srivastava 2014; Thomas 2015). However, evidence from the Census of India presented in this paper raises questions regarding the extent and nature of such a structural transformation of the work force in rural India. The Census data show a considerable increase in marginal agricultural labourers in the 2000s, especially in regions of the country where the NSS had registered a decline in the size of the agricultural work force and a rise in rural construction jobs. There have been important regional differences, over the years, with respect to the pace and nature of the growth of the labour force in India. In this paper, for region-wise analysis, Indian States have been categorized according to their geographical location. Thus, States belonging to the northern, southern, western, eastern, central-eastern, and north-eastern regions have been grouped and analysed together. Further details are available in Appendix A and Appendix Table A1. The NSSO defines “workers” as “persons who, at the time of enumeration, are engaged in any economic activity that adds value to the national product.” Such activities may include (i) the production of all goods and services for the market; (ii) government services; (iii) the production of primary commodities for own consumption; and (iv) own-account production of fixed assets, including the construction of own houses, roads, and wells. The Census categorises workers as main and marginal based on the number of days they worked during the reference period, which is one year preceding the date of enumeration. Main workers are persons who worked for a major part of the reference period (that is, for six months or more). Persons who worked for less than six months during the reference period are termed marginal workers. The NSSO defines “usual principal status workers” as persons who worked for a “relatively large part” of the reference period, which is one year preceding the date of the survey. From the rest of the population, the NSSO identifies “usual subsidiary status workers,” persons who worked for at least 30 days during the reference period. As shown above, there are broad similarities in the definitions of workers according to the Census and the NSSO. At the same time, it should be noted that the definition of main workers (workers who worked for six months or more) in the Census has greater clarity than the NSSO’s definition of principal status workers (workers who worked for a relatively large part of the reference period). Consider, for instance, the case of a person who worked for five-and-a-half months. While the Census would automatically exclude him/her from the category of main workers, it is possible that an NSSO investigator would decide to include him/her in the category of principal status workers. On the other hand, the definition of marginal workers (workers who worked for short periods, between 0 and 6 months) in the Census is more ambiguous than the NSSO’s definition of subsidiary status workers (workers who worked for at least 30 days). The ambiguities in definitions discussed above may lead to serious problems in estimating the true size of the work force, especially when the investigators are not very well trained – and worse, if these investigators are employed on a contract basis by the statistical agencies. Increasing migration of workers in search of employment opportunities is another factor that poses problems for the estimation of the true size and nature of the work force. Consider the case of a short-term migrant who works as a construction worker in an urban location for close to six months, and returns to his village to engage in agricultural work for the rest of the year. He will be considered a rural resident, but investigators will find it difficult to define precisely the nature and location of his work. In this paper, estimates of the work force based on the Census are compared with estimates based on an NSSO survey conducted close to the Census year. Thus, trends in employment in India emerging from Census 1981, Census 1991, Census 2001, and Census 2011 are compared with trends from NSSO surveys held in 1983 (38th Round), 1993–94 (50th Round), 1999–2000 (55th Round), and 2011–12 (68th Round), respectively. A well-known challenge faced by the Indian economy is the small size of its labour force relative to the size of the population, especially with respect to women. In 2013, the labour force participation rate (LPR) in India was only 52 per cent, as compared to 71 per cent in China and 65.5 per cent in Brazil (taking into account the population aged 15 years and above).2 LPR denotes the sum of persons who are employed and persons who are unemployed but seeking jobs as a proportion of the population. The proportion of persons in the population who are employed is denoted by the work force participation rate (WPR) or worker population ratio. In 2011, according to data from the Census, the WPR in India was 53.2 per cent for males and only 25.5 per cent for females (considering population of all ages) (Table 1). Source: Economic Tables, Census of India, various years. The WPRs for both men and women according to the Censuses of 1981 and 1991 were less than the corresponding WPRs registered by the NSSO surveys in 1983 and 1993–94, respectively. The differences between the two rates were particularly large in the case of females. The female WPR was 22.3 per cent only according to Census 1991, but 28.6 per cent according to the NSSO in 1993–94 (see Tables 1 and 2). It has been argued that the Censuses of 1981 and 1991 underestimated marginal occupations, especially of females, resulting in lower WPR estimates (Kumar and Sharma 2002; Bhagat and Das 2008; Kasturi 2015). Note: NSSO=National Sample Survey Organisation; PS=principal status workers; SS=subsidiary status workers; UPSS=usual principal and usual subsidiary status workers; WPR=work participation rate. In Census of India 2001, efforts were made to address the issue of underestimation of the work force by giving better training to enumerators and devoting special attention to capture marginal employment of females (Kumar and Sharma 2002; Bhagat and Das 2008). Possibly as a result of these, the WPRs for females estimated from Census 2001 and from the NSSO survey of 1999–2000 converged to almost the same level: 25.6 per cent and 25.9 per cent respectively. Interestingly, the female WPR as recorded by Census 2011 (25.5 per cent) was higher than the female WPR estimated from the NSSO survey of 2011–12 (21.9 per cent) (Tables 1 and 2). In the case of males, WPRs based on data from the Census and from the NSSO surveys have been very close to each other. As a proportion of the male population, male workers formed 54.4 per cent according to the NSSO survey of 2011–12 and 53.2 per cent according to Census 2011 (Tables 1 and 2). However, the WPRs of persons who worked for a relatively large part of the reference period and of persons who worked for only short periods differed greatly between the Census and the NSSO. Census data showed the proportion of persons in the population who worked for a major part of the reference year to be smaller than in the NSS, while the proportion of those who worked for only short periods was bigger. This was true for both male and female workers. To illustrate, for males, WPR among main workers according to Census 2011 was 43.8 per cent, much lower than principal status WPR according to the NSSO survey of 2011–12, which was 53.7 per cent. On the other hand, WPR among marginal workers (according to Census 2011) and subsidiary status WPR (according to the NSSO survey of 2011–12) for males in these years were 9.4 per cent and 0.7 per cent respectively (see Tables 1 and 2). These disparities between the Census and the NSSO with respect to WPRs may be partly on account of differences in their definitions of the work force (discussed above). In studies using data from the NSSO, the actual size of the work force is estimated by multiplying WPRs from NSSO surveys with population figures from the Censuses of India. Accordingly, based on the 2011–12 survey of the NSSO, the size of India’s work force was calculated to be 472.5 million (see Table 3). At the same time, the size of India’s work force as directly measured by Census 2011 was marginally higher, 482 million. However, the differences between the estimates based on the two data sources were much greater for various categories of workers. Persons who worked for a major part of the reference year numbered 362 million according to Census 2011, but a much higher 435 million according to the NSSO survey of 2011–12. At the same time, persons who worked for only a short period numbered 119 million according to the Census, and 38 million according to the NSSO (see Tables 3 and 4). Notes: NSSO=National Sample Survey Organisation; PS=principal status workers; and SS=subsidiary status workers. Source: NSSO (2014); Economic Tables, Census of India 2011. Census data show work force participation rates to vary widely across States (Tables 5 and 6). Strikingly, WPRs in the western and southern States were well above the nation-wide average, while WPRs in the eastern and northern States were below the national average. The lead of the western and southern States is particularly substantial if we consider the participation rates of only main workers. In 2011, main workers as a proportion of the population among males was 51.9 per cent in the western States, but only 37.4 per cent in the eastern States. For females, the corresponding proportions were 23.6 per cent in the southern States and only 8.8 per cent in the eastern States (Tables 5 and 6). Across States, in the case of males, the proportions (in respective populations) of main workers according to Census 2011 were lower than the proportions of principal status workers according to the NSSO survey of 2011–12 (see Figure 1). On the other hand, the proportions of marginal workers were higher than the proportions of subsidiary status workers. Both the differences between main WPR and principal status WPR, and between marginal WPR and subsidiary status WPR, were high in several States. All these States – namely, Jharkhand, Odisha, Bihar, Himachal Pradesh, Jammu and Kashmir, Uttar Pradesh, Madhya Pradesh, Chhattisgarh, and West Bengal (Figure 1) – belong to the eastern, central-eastern or northern regions of India. Many of them are poorer and more agricultural than the rest of India. Notes: (i) The x-axis plots the difference between main WPR (Census) and principal status WPR (NSSO). The y-axis plots the difference between marginal WPR (Census) and subsidiary status WPR (NSSO). (ii) WPR=Work participation rate; Coeft=Coefficient; pp=percentage points. The abbreviations used in the figure for the States of India are as follows: AP=Andhra Pradesh; AS=Assam; BH=Bihar; CH=Chhattisgarh; GA=Goa; GJ=Gujarat; HR=Haryana; HP=Himachal Pradesh; J&K=Jammu and Kashmir; JH=Jharkhand; KN=Karnataka; KL=Kerala; MP=Madhya Pradesh; MH=Maharashtra; MN=Manipur; MG=Meghalaya; OD=Odisha; PB=Punjab; RJ=Rajasthan; TN=Tamil Nadu; TR=Tripura; UP=Uttar Pradesh; UT=Uttarakhand; WB=West Bengal. The reason for the discrepancies discussed above is, it appears, the disagreement between the Census and the NSSO on the nature of employment of a segment of the population within these States. While the NSSO found that these workers were employed for a relatively large part of the reference period, the Census estimated that they worked for only short periods. Consider, for instance, the case of Bihar in the Census year 2011 (National Sample Survey year 2011–12). Both the Census and the NSSO found that 46 to 47 per cent of the male population in the State were employed. According to the NSSO, almost all these workers had worked for a relatively large part of the previous year. Principal status WPR was 46.3 per cent while subsidiary status WPR was only 0.5 per cent. However, according to the Census, main workers accounted for only 31.5 per cent and marginal workers for 14.6 per cent of the male population in Bihar. How have India’s labour markets changed since the 1990s? A number of studies have attempted to answer this question using evidence from the NSSO surveys. These studies identify distinct phases with respect to the size and nature of employment generated in the country in the post-1990 years (Thomas 2012 and 2015; Chand and Srivastava 2014; Mehrotra et al. 2014). According to NSSO surveys conducted in 1993–94 and 1999–2000, employment growth in India slowed down markedly in the 1990s. Overall WPR and WPR for principal status workers in the country declined between these years for males and females (Table 2). The net increase in employment fell to 24 million between 1993–94 and 1999–2000, from 71 million between 1983 and 1993–94. Further, a large share of the incremental employment created in the country in the 1990s was on account of casual labour (Thomas 2012). The employment growth trends that emerged from the NSSO surveys raised concerns about the sustainability of the economic reforms inaugurated in the country in the 1990s. According to the NSSO, India’s overall employment growth showed noticeably different trends in the first and second half of the 2000s. Between 1999–2000 and 2004–5, WPRs increased for both males and females, and overall employment in the country increased sharply, by 59.4 million. On the other hand, between 2004–5 and 2011–12, WPR declined steeply for females and overall employment increased by only 14.7 million (Table 2 and Thomas 2015). However, as previous studies have shown, the overall employment growth figures referred to above give a somewhat misleading picture of the nature of employment growth in the first half and second half of the 2000s. Almost one-third of the increase in employment in India in the first half of the 2000s (17.4 million out of 59.4 million) occurred in agriculture and allied activities. Further, of the incremental employment in agriculture in this period, an overwhelming proportion (15.5 million out of 17.4 million) was accounted for by self-employed rural females (Thomas 2015). The rise in agricultural employment in the first half of the 2000s was perplexing, mainly because these were years in which GDP growth in agriculture had been statistically insignificant. Given this context, some scholars have suggested that the increase in agricultural employment in the first half of the 2000s was distress-driven (Abraham 2009; Thomas 2012). In the second half of the 2000s, employment in agriculture and allied activities fell by 33.3 million, non-agricultural employment rose by 48 million, and, as a result, overall employment in India increased by only 14.7 million. The decline in agricultural employment in India after the mid-2000s was, to a large extent, due to the withdrawal of females from self-employment in agriculture (Thomas 2015). Previous studies have argued that both “push” and “pull” factors triggered the movement of the work force away from agriculture after the mid-2000s (Thomas 2012; Chand and Srivastava 2014; Thomas 2015). On the one hand, it is well known that there is a high degree of inequality in rural India, especially with respect to land distribution (with a few notable exceptions, namely, the States of Kerala, West Bengal, Tripura, Himachal Pradesh, and Mizoram) (Appendix Table B1). Further, the agricultural sector is overcrowded, with the agricultural population (cultivators and agricultural labourers combined) per unit of sown area of agricultural land being particularly high in States like Bihar, Uttar Pradesh, West Bengal, and Tamil Nadu (Appendix Table B1). At the same time, incomes per capita and productivity levels in Indian agriculture are low. Surveys conducted by the Foundation for Agrarian Studies, for instance, showed that a significant proportion of cultivator households in selected villages in Maharashtra and Andhra Pradesh earned negative incomes from crop production in 2005–6 (Ramachandran and Rawal 2010). Public investment in irrigation and agricultural research has declined from the 1990s onwards. Erratic climatic patterns – droughts, floods, and unseasonal rains – have added to the vulnerability of Indian farmers. Farmers’ suicides continue to be reported from several regions of the country. There are also increasing instances across the country of farmland being acquired for commercial and industrial purposes. Because of all these factors, workers are under intense pressure to move out of the agricultural sector. A number of “pull” factors also appear to have been critical in drawing the work force out of agriculture. First, after a phase of stagnation in the 1990s, the growth of agricultural incomes in India revived in 2004–5 and this growth continued at a fast pace until 2011–12 (Chand et al. 2015). Secondly, the NSS data record a marked acceleration in the growth of employment in construction jobs in rural India after 2004–5. 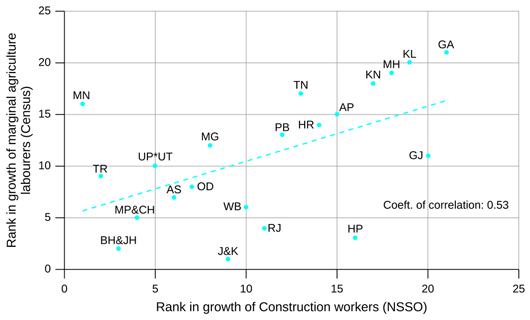 Notably, a significant part of the increase in construction jobs occurred in the States of Bihar, Uttar Pradesh, Rajasthan, and Madhya Pradesh. Thirdly, a sharp rise in the population of students in India, notably in rural areas and among females, has influenced India’s labour market since the 2000s (Thomas 2015). The ratios of students to population among rural males and rural females belonging to the age-group 15 to 19 years increased by 20 percentage points between 2004–5 and 2011–12. These ratios rose to 64 per cent and 54 per cent (for rural males and rural females) respectively by 2011–12. Students accounted for 47 million (or 72 per cent) of the incremental population of 65 million in India’s rural areas in this period. The decline in the number of workers employed in agriculture went hand in hand with a marked rise in persons attending educational institutions in rural India. It is noteworthy that the fall in agricultural employment in India between 2004–5 and 2011–12 was almost entirely accounted for by persons less than 35 years of age (Thomas 2015). Lastly, the Mahatma Gandhi National Rural Employment Guarantee Act (MGNREGA), launched by the Central Government in the mid-2000s, has had a substantial impact on rural employment and rural wages. In 2011–12, 6.7 million casual workers were engaged in public works in the country, of whom 2.9 million workers were employed through the MGNREGA (Thomas 2015). Thomas (2014) showed that casual employment in public works accounted for 69 per cent of the incremental non-agricultural employment for rural females in the country between 2004–5 and 2011–12. Chand and Srivastava (2014) noted that the impact of MGNREGA on total labour supply in rural India may have been limited, but the rural employment scheme played a major role in raising real wages in the country’s rural areas after the mid-2000s. Usami (2012) found that the real wages of agricultural labourers in India remained stagnant or even declined slightly between 1999–2000 and 2006–7, but real wages began to rise after 2007–8. According to the NSS data, the average annual growth rate of real wages of casual workers among rural females (aged 15–59 years) engaged in work other than public works, which was only 1.4 per cent between 1999–2000 and 2004–5, accelerated to 4.4 per cent between 2004–5 and 2009–10, and to 7.2 per cent between 2004–05 and 2011–12. A similar acceleration in wage rates occurred in the case of rural males as well (Thomas 2015). Thorat and Dubey (2012) noted that consumption expenditure improved and poverty declined in rural India between 2004–5 and 2009–10. It has therefore been argued that the withdrawal of workers, especially female workers, from agriculture from the mid-2000s onwards was associated with an improvement – not a worsening – of economic conditions in rural India (Thomas 2012). At the same time, however, India faces several hurdles in the way of a large-scale transfer of its work force to industry and services. First, it is clear that the increase in non-agricultural employment in India in the 2000s was inadequate to meet the challenge of rising labour supply. Using NSSO data, Thomas (2014) has shown that the labour force engaged in India’s non-agricultural sectors could have potentially grown at a rate of 14.7 million a year between 2004–5 and 2011–12 (considering the rate of growth of the working-age population, the rate of growth of the population of students, and the rate at which workers were exiting agriculture in this period). At the same time, Thomas (2014) also found that the actual rate of growth of non-agricultural employment in the country in the period 2004–5 to 2011–12 was far slower, 6.5 million jobs a year. Secondly, it is noteworthy that construction – which is a relatively low-wage sector –accounted for almost half of the incremental non-agricultural employment (23.9 million out of 48 million workers) generated in India between 2004–5 and 2011–12. Further, it is not very clear what accounts for the large increases, as reported by NSS data, in the number of persons employed in rural construction in States such as Uttar Pradesh, Rajasthan, and Bihar since the mid-2000s (Thomas 2012). The rise in development expenditure by the Central and State governments after the mid-2000s may have aided rural employment generation in these States.3 The increase in construction of pucca houses in rural areas may also have been a factor that helped the growth of rural construction jobs. At the same time, it is striking that the value added per rural construction worker fell sharply in India after the mid-2000s. Thomas (2012) showed that the construction sector contributed only 8.6 per cent to India’s GDP growth between 2004–5 and 2009–10, despite the fact that this sector accounted for more than 80 per cent of the incremental non-agricultural employment generated in the country in the same period. Thirdly, one of the biggest hurdles to the structural transformation of the work force is the slow growth of manufacturing employment in India. In 2011–12, the manufacturing sector employed only 61.3 million or 13 per cent of the country’s total work force. Between 2004–5 and 2011–12, the manufacturing sector generated only 5.1 million new jobs, or approximately 10 per cent of the incremental non-agricultural employment (48 million) created in the country in this period. The growth of manufacturing employment slowed down after the mid-2000s, particularly with respect to small, unorganised sector industries (Thomas 2015). In comparison, the manufacturing sector played a far bigger role in the economic transformation of the East Asian countries and China. Bramall (2006) has described how rural industrialisation helped transform the Chinese countryside after 1978, providing close to 200 million jobs to rural workers and reducing rural poverty. Finally, the falling elasticity of employment in the services sector is another cause of concern. Employment was created in India’s services sector at a rate of 2.6 million jobs a year between 1983 and 1993–4, which rose to 3.6 million jobs a year between 1993–4 and 2004–5, but fell to 2.7 million jobs a year between 2004–5 and 2011–12 (Thomas 2015). Employment creation in community, social, and personal services (which include education and government services) slowed down sharply from the 1990s onwards. These services generated a total of 11.6 million jobs between 1983 and 1993–4, 9 million jobs between 1993–4 and 2004–5, and only 3.4 million jobs between 2004–5 and 2011–12 (ibid.). The slow growth of employment in manufacturing and services has been a hindrance to not only the structural transformation of the work force, but also to female participation in the labour force. Census of India data allow us to categorise workers into cultivators, agricultural labourers, and workers other than cultivators and agricultural labourers. The last category includes non-agricultural workers, as well as workers in activities allied to agriculture such as plantations and forests. According to Census 2011, out of India’s total work force of 481.7 million, 118.7 million were cultivators and 144 million were agricultural labourers. Cultivators and agricultural labourers together numbered 263 million or 54.6 per cent of the country’s work force in 2011 (Table 7). It is striking that the proportion of India’s work force engaged in agriculture is much higher in Census of India data than in the NSS data. The NSSO survey of 2011–12 found that workers engaged in agriculture and allied activities numbered 225 million out of India’s estimated work force of 472.5 million, or 47.6 per cent of the total work force (see Table 8). Of these, workers employed in activities allied to agriculture – animal production (12.7 million), forestry and logging (0.7 million), and fishing and aquaculture (1.6 million) – constituted 14.9 million. Therefore, workers engaged in the agricultural sector alone numbered 210 million or 44.5 per cent of the total work force according to the NSSO, less than the combined share of cultivators and agricultural labourers (54.6 per cent) in the work force according to the Census. Source: Estimates based on NSSO (2001) and NSSO (2014). On the other hand, workers engaged in non-agricultural occupations numbered 248 million or 52.4 per cent of the total work force according to the NSSO survey of 2011–12 (see Table 8). In comparison, according to Census 2011, workers other than cultivators and agricultural labourers numbered only 219 million or 45.4 of the total work force (see Table 7). The NSSO categorises workers into casual workers, regular employees, and the self-employed. The self-employed in agriculture correspond roughly to cultivators. According to the NSSO survey of 2011–12, the self-employed in agriculture and allied activities numbered 147 million. This was almost 30 million more than the number of cultivators according to Census 2011 (118.7 million) (see Tables 7 and 8). Even if we separate out the self-employed in agriculture alone according to the NSSO, that would still number higher than cultivators according to the Census. On the other hand, the NSSO’s estimate for 2011–12 of casual employees in agriculture and allied activities (76 million) was considerably lower than the Census 2011 estimate of agricultural labourers (144 million) (see Tables 7 and 8). Therefore, with respect to the size of India’s work force dependent on agriculture, the Census of India gives us a bigger figure than does the NSSO. At the same time, with respect to the differentiation within that work force, the number of cultivators in the country according to the Census is lower than the number recorded by the NSSO, and the number of agricultural labourers according to the Census is higher than the number recorded by the NSSO. A noteworthy feature of India’s labour markets in the two decades since 1991 is a decline in the relative size of the population of main workers and an increase in the relative size of the population of marginal workers. The number of main workers as a proportion of the male population fell by almost 7.1 percentage points (from 50.9 per cent to 43.8 per cent) and number of marginal workers as a proportion of the male population rose by 8.8 percentage points (0.6 per cent to 9.4 per cent) between 1991 and 2011 (Table 1). Concurrent transformations occurred in India’s agrarian structure: a decline in the size of the work force of cultivators and an increase in the size of the work force of agricultural labourers. The number of main cultivators in the country declined from 111 million in 1991 to 104 million in 2001 and 96 million in 2011. Cultivators who were main workers as a proportion of the male population fell from 20.3 per cent in 1991 to only 11.7 per cent in 2011 – a decline of 8.6 percentage points (see Table 9). This was the major reason for the fall in the WPR for male main workers by 7.1 percentage points between 1991 and 2011 (referred to above; see Table 1). At the same time, the Census data also indicated that the number of agricultural labourers (main and marginal categories combined) in India increased from 86 million in 1991 to 107 million in 2001 and 144 million in 2011. As a proportion of the male population, male agricultural labourers in the marginal category increased by 4.2 percentage points (from 0.2 per cent to 4.4 per cent) between 1991 and 2011 (Table 9). This was the main factor behind the rise, by 8.8 percentage points, in the number of marginal workers as a proportion of the population of males between 1991 and 2011 (see Table 1). It is notable that marginal workers accounted for more than half of the net addition to India’s work force between 1991 and 2011, 91 million marginal workers out of a total increase of 167 million. In fact, in the 1990s (1991–2001), almost 70 per cent of the incremental employment in the country was in the category of marginal workers. However, in the 2000s (2001–2011), a larger number of main workers than marginal workers were added to India’s work force, 49 million main workers out of a total increase of 79 million (Table 4). The combined size of cultivators and agricultural labourers in India climbed from 211 million in 1991 to 234 million in 2001 and 263 million in 2011. It is remarkable that according to the Census, the population engaged in agriculture (cultivators and agricultural labourers) went up by 29 million in the 2000s. By contrast, the NSSO found that the number of workers engaged in agriculture and allied activities declined by 16 million between 1999–2000 and 2011–12. Workers engaged in agriculture and allied activities increased by 17.4 million between 1999–2000 and 2004–5, and subsequently declined by 33.3 million between 2004–5 and 2011–12 (Tables 7 and 8). There are also differences between the two data sources on the composition of the agricultural population. While the Census, as noted above, finds a decline in the number of cultivators and a rise in the number of agricultural labourers, the NSSO data seem to point in a different direction. According to the NSSO, the number of the self-employed in agriculture rose while the number of casually employed in agriculture fell between 1999–2000 and 2011–12. Finally, employment in non-agricultural sectors in India, according to the NSSO, increased by 90 million in the 2000s. The corresponding increase in workers other than cultivators and agricultural labourers according to the Census was much less, only 51 million (Tables 7 and 8). There are interesting differences between the Census and NSSO data with respect to the growth of female employment in India in the 2000s. The WPR among female main workers according to Census 2001 (14.7 per cent) was smaller than the WPR among female principal status workers according to the NSSO of 2004–5 (21.5 per cent) in the early 2000s. However, over the 2000s, the WPR among female main workers increased according to the Census (from 14.7 per cent in 2001 to 15.2 per cent in 2011), while the WPR among female principal status workers decreased according to the NSSO (from 21.5 per cent in 2004–5 to 16.1 per cent in 2011–12) (Tables 1 and 2). Source: Economic Tables, Census of India 2011. Both the decline in the size of the work force of main-worker cultivators and the increase in the size of the work force of marginal-worker agricultural labourers in India between 1991 and 2011 were more pronounced in the eastern, central-eastern, and northern States than in the southern and the western States (Table 11 and Appendix Table B1). Thus, the number of cultivators (main workers) as a proportion of the male population declined by 10.4 percentage points in the eastern States and by 6.2 percentage points in the southern States. The number of agricultural labourers (marginal workers) as a proportion of the male population increased by 7.6 percentage points in the eastern States and by only 2.3 percentage points in the southern States over the two decades after 1991 (Table 11 and Appendix Table B1). Parallel to the above, we see that the number of main workers as a proportion of the male population declined by 11.5 percentage points between 1991 and 2011 in the eastern States. The corresponding changes were far less in the western States (hardly any change) and the southern States (a decline of only 2.6 percentage points). On the other hand, the number of marginal workers as a proportion of the male population increased by 13.2 percentage points in the eastern States and by only 3.9 percentage points in the western States (Table 5). The agrarian changes discussed above relate to the two decades after 1991. In Figure 2, we focus more closely on the changes that occurred across Indian States in the 2000s. It shows that the share of main cultivators in the population decreased, while that of marginal agricultural labourers increased in the case of males in several eastern, central-eastern, and northern States. These States are Bihar, Jharkhand, Chhattisgarh, Madhya Pradesh, Jammu and Kashmir, Uttar Pradesh, Odisha, and West Bengal (Figure 2). In Bihar, for instance, the number of cultivators declined from 8.2 million to 7.2 million while the number of agricultural labourers rose from 13.4 million to 18.3 million between 2001 and 2011. Notes: Coeft=Coefficient; pp=percentage points. The abbreviations used in the figure for the States of India are as follows: AP=Andhra Pradesh; AS=Assam; BH=Bihar; CH=Chhattisgarh; GA=Goa; GJ=Gujarat; HR=Haryana; HP=Himachal Pradesh; J&K=Jammu and Kashmir; JH=Jharkhand; KN=Karnataka; KL=Kerala; MP=Madhya Pradesh; MH=Maharashtra; MN=Manipur; MG=Meghalaya; OD=Odisha; PB=Punjab; RJ=Rajasthan; TN=Tamil Nadu; TR=Tripura; UP=Uttar Pradesh; UT=Uttarakhand; WB= West Bengal. On the other hand, the shares in the population of male cultivators (main workers) and agricultural labourers (marginal workers) declined in some other States. These include the southern States of Kerala, Tamil Nadu, Karnataka, and Andhra Pradesh, as well as Goa and Punjab (Figure 2). Figure 3 plots the changes in the share of male cultivators (main category) in the male population and the share of female agricultural labourers (main and marginal combined) in the female population across Indian States between 2001 and 2011. 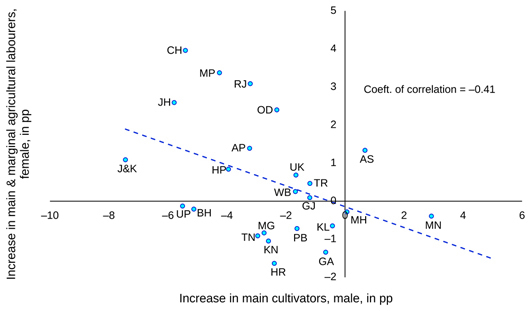 The decline in the share of male cultivators (main category) in the male population was associated with an increase in the share of female agricultural labourers (main and marginal combined) in the female population in several States, – notably Chhattisgarh, Madhya Pradesh, Rajasthan, Jharkhand, Odisha, and Andhra Pradesh. On the other hand, the share of female agricultural labourers (main and marginal combined) in the female population declined in most southern States (Kerala, Tamil Nadu, and Karnataka), as well as in Haryana, Punjab, and Goa. It is to be noted that the share of female agricultural labourers (main and marginal combined) in the female population declined in Bihar and Uttar Pradesh, whereas it increased noticeably in Andhra Pradesh, between 2001 and 2011 (Figure 3). Note: Coeft=Coefficient; pp=percentage points. The abbreviations used in the figure for the States of India are as follows: AP=Andhra Pradesh; AS=Assam; BH=Bihar; CH=Chhattisgarh; GA=Goa; GJ=Gujarat; HR=Haryana; HP=Himachal Pradesh; J&K=Jammu and Kashmir; JH=Jharkhand; KN=Karnataka; KL=Kerala; MP=Madhya Pradesh; MH=Maharashtra; MN=Manipur; MG=Meghalaya; OD=Odisha; PB=Punjab; RJ=Rajasthan; TN=Tamil Nadu; TR=Tripura; UP=Uttar Pradesh; UT=Uttarakhand; WB= West Bengal. The NSSO surveys show that the size of the work force engaged in agriculture and allied activities declined in most Indian States between 1999–2000 and 2011–12. On the other hand, the Census data indicate that the population engaged in agriculture (cultivators and agricultural labourers combined) increased in absolute numbers in most Indian States between 2001 and 2011. Clearly, the two data sources are incompatible with each other when it comes to absolute numbers and even the direction of growth of the agricultural work force. But is there some consistency between the Census and the NSSO with respect to the relative rates of growth of the agricultural work force across States? We plotted the rankings of Indian States with respect to the rates of growth of the work force attached to agriculture in the first decade of the 2000s, using data from the Census and from the NSSO (Figure 4). The rankings based on the two sources are closely aligned to each other, and even identical in the case of a few States. These are the southern States of Kerala, Tamil Nadu, Karnataka, and Andhra Pradesh, as well as Goa, Jammu and Kashmir, and Punjab. These States are in the bottom half of the ranking of Indian States with respect to the growth of the agricultural work force, irrespective of whether this growth is estimated using Census or NSS data. The shares of the work force of cultivators and of agricultural labourers in the population were low in Kerala, Tamil Nadu, Karnataka, and Goa (Figures 2 and 3, and Appendix Table B1). 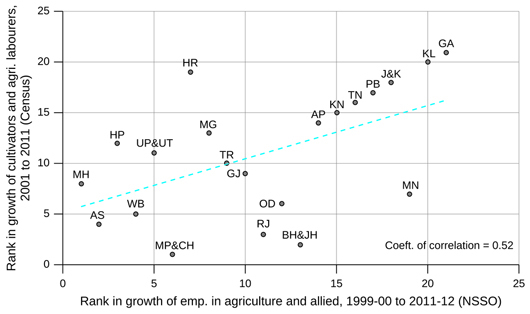 Notes: (i) Plotted on the x-axis are the ranks of States with respect to the growth of UPSS workers (male and female) engaged in agriculture and allied activities between 1999–2000 and 2011–12; plotted on the y-axis are the ranks of States with respect to the growth of cultivators and agricultural labourers (male and female, main and marginal) between 2001 and 2011. (ii) Coeft=Coefficient. The abbreviations used in the figure for the States of India are as follows: AP=Andhra Pradesh; AS=Assam; BH=Bihar; CH=Chhattisgarh; GA=Goa; GJ=Gujarat; HR=Haryana; HP=Himachal Pradesh; J&K=Jammu and Kashmir; JH=Jharkhand; KN=Karnataka; KL=Kerala; MP=Madhya Pradesh; MH=Maharashtra; MN=Manipur; MG=Meghalaya; OD=Odisha; PB=Punjab; RJ=Rajasthan; TN=Tamil Nadu; TR=Tripura; UP=Uttar Pradesh; UT=Uttarakhand; WB= West Bengal. Source: NSSO (2001); NSSO (2014); Economic Tables, Census of India, various years. In Kerala, Tamil Nadu, and Punjab, the level of rural wages was relatively high, and the growth of rural wages after the middle of the decade has been at relatively fast rates. This indicates that the shift of the work force away from agriculture, as suggested in the Lewisian model, is under way in these States (Reddy 2015). It is also notable that the share of the work force of non-agricultural labourers in the population increased more in the southern States than in the rest of India between 1991 and 2011 (see Table 11). The findings from the Census and the NSSO were compatible with each other with respect to Maharashtra, Assam, and West Bengal. The population dependent on agriculture grew faster than the national average in these States in the 2000s, according to both the data sources. On the other hand, there were discrepancies between the rankings based on the Census and the NSSO in Bihar (undivided – we refer to Bihar and Jharkhand combined after 2000), Rajasthan, Odisha, Madhya Pradesh (undivided – we refer to Madhya Pradesh and Chhattisgarh combined after 2000), Haryana, Uttar Pradesh (undivided – we refer to Uttar Pradesh and Uttarakhand combined after 2000), and Himachal Pradesh. The Census recorded much faster growth – in absolute rates and relative to the national average – of the population dependent on agriculture in some of these States (Bihar, Rajasthan, Odisha, Madhya Pradesh). Consider, for instance, the case of Bihar (undivided). According to the NSSO, workers engaged in agriculture and allied activities in Bihar declined by 2.4 million between 1999–2000 and 2011–12, pushing it to the bottom half of the rankings (with a rank of 13 out of 21) of Indian States with respect to growth of the agricultural work force. On the other hand, cultivators and agricultural labourers combined increased by 5.4 million in Bihar (undivided) between 2001 and 2011, according to the Census. Bihar was ranked second out of 21 Indian States with respect to the growth of the number of cultivators and agricultural labourers in this period. In order to understand the discrepancies between the Census and the NSSO, we studied more closely the growth rates of two categories of workers based on the two data sources: agricultural labourers (marginal workers, and from the Census) and construction workers (NSSO). Agricultural labourers (marginal workers, and especially males) contributed the most to the growth of the agricultural work force in India in the first decade of the 2000s, according to the Census. At the same time, as discussed earlier, almost half of the incremental non-agricultural employment generated in India between 2004–5 and 2011–12 (23.9 million out of 48 million) was in construction, according to the NSSO. An overwhelming proportion of this increase in construction jobs (20.5 million out of the net increase of 23.9 million) occurred in rural areas. Further, the largest expansion of rural construction jobs after the middle of the decade was recorded in the States of Bihar, Madhya Pradesh, Uttar Pradesh, and Rajasthan (Thomas 2015). Figure 5 plots the rankings of Indian States with respect to the growth of the work force of agricultural labourers (marginal) according to the Census and the growth of the work force of construction workers according to the NSSO. It is remarkable that these rankings are closely aligned with each other in some States, notably Bihar (undivided), Madhya Pradesh (undivided), and Odisha. There is close association in these States even with respect to the growth in absolute numbers of the two worker-categories. Thus, the increases in the number of agricultural labourers who were marginal workers (Census) and construction workers (NSSO) in the first decade of the 2000s were 5.8 million and 4 million respectively in Bihar (undivided), 3.1 million and 3.4 million respectively in Madhya Pradesh (undivided), and 1.4 million and 1.5 million respectively in Odisha (Table 12). Notably, Bihar, Jharkhand, Madhya Pradesh, Chhattisgarh, and Odisha were among the States that showed high discrepancies between the Census and the NSSO with respect to the estimates of growth of the agricultural work force (Figure 4). Notes: (i) Plotted on the x-axis are the ranks of States with respect to the growth of UPSS workers (male and female) engaged in construction between 1999–2000 and 2011–12; plotted on the y-axis are the ranks of States with respect to the growth of marginal agricultural labourers (male and female) between 2001 and 2011. (ii) Coeft=Cefficient. The abbreviations used in the figure for the States of India are as follows: AP=Andhra Pradesh; AS=Assam; BH=Bihar; CH=Chhattisgarh; GA=Goa; GJ=Gujarat; HR=Haryana; HP=Himachal Pradesh; J&K=Jammu and Kashmir; JH=Jharkhand; KN=Karnataka; KL=Kerala; MP=Madhya Pradesh; MH=Maharashtra; MN=Manipur; MG=Meghalaya; OD=Odisha; PB=Punjab; RJ=Rajasthan; TN=Tamil Nadu; TR=Tripura; UP=Uttar Pradesh; UT=Uttarakhand; WB= West Bengal. Note: *Refers to Bihar (undivided), Madhya Pradesh (undivided), and Uttar Pradesh (undivided), respectively. Is it possible that at least a segment of India’s rural work force was identified in 2011/2011–12 as agricultural labourers (marginal workers) by the Census and as construction workers by the NSSO? Could this be the reason for the above-mentioned disparities between the Census and the NSSO? Indeed, we find that the disparities between the two data sources are considerably reduced if we compare workers engaged in agriculture and allied activities, and construction combined (NSSO), with cultivators and agricultural labourers combined (Census) (Table 12). Consider Bihar (undivided), for instance, where the disparities are very striking. In the 2000s, cultivators and agricultural labourers combined (Census) in this State increased by 5.4 million, whereas workers engaged in agriculture and allied activities (NSSO) declined by 2.4 million. But if we add construction to agriculture and allied activities, the workers in this combined category (NSSO) are seen to have increased by 1.7 million – which is more in line with Census data. In India as a whole, in the first decade of the 2000s, the number of cultivators and agricultural labourers combined (Census) increased by 28.9 million, and the number of workers engaged in agriculture and allied activities, and construction combined (NSSO) increased by 16.3 million (Table 12). If the hypothesis discussed above is correct, what are its possible implications? One inference that can be drawn is that an agricultural labourer (marginal worker) and a construction worker are not very different from each other with respect to the nature and conditions of their work, especially in the rural areas of States such as Bihar, Madhya Pradesh, and Odisha. There are a few factors that suggest that this may indeed have been the case. On the one hand, rural construction jobs, which increased sharply from the middle of the decade in States such as Bihar, Uttar Pradesh, and Rajasthan, are characterized by low wages and low value addition (as already discussed). It is notable that even as construction’s share in total employment in India rose sharply, from 5.7 per cent in 2004–5 to 10.6 per cent in 2011–12, its contribution to India’s GDP hardly changed (7.7 per cent and 7.8 per cent respectively in these years). The increase in marginal agricultural labourers by the end of the first decade of the 2000s, as shown by the Census data, does not appear to be necessarily linked to a worsening of agrarian conditions. The States that registered fast growth of the work force of agricultural labourers (marginal) were also the ones in which agricultural incomes grew at a relatively fast pace between 2004–05 and 2011–12. Bihar and Chhattisgarh are good examples (Figure 6). Moreover, the revival of real wages for agricultural and rural labourers in India after 2007–08 was marked in some of these States, including Odisha, Bihar, Madhya Pradesh, and Uttar Pradesh (Usami 2012). Note: Coeft.=Coefficient. The abbreviations used in the figure for the States of India are as follows: AP=Andhra Pradesh; AS=Assam; BH=Bihar; CH=Chhattisgarh; GA=Goa; GJ=Gujarat; HR=Haryana; HP=Himachal Pradesh; J&K=Jammu and Kashmir; JH=Jharkhand; KN=Karnataka; KL=Kerala; MP=Madhya Pradesh; MH=Maharashtra; MN=Manipur; MG=Meghalaya; OD=Odisha; PB=Punjab; RJ=Rajasthan; TN=Tamil Nadu; TR=Tripura; UP=Uttar Pradesh; UT=Uttarakhand; WB= West Bengal. Source: National Accounts Statistics; Economic Tables, Census of India, various years. Another possibility is that the discrepancies referred to above between the Census and the NSSO arose due to difficulties faced by the investigators in capturing short-term migration. There are reports of growing short-term migration of workers, noticeably from the eastern and northern States, including from Bihar, Uttar Pradesh, West Bengal, and Odisha. According to the NSSO survey of 2009, male emigrants from Uttar Pradesh, Bihar, Rajasthan, and Odisha who migrated in search of employment opportunities numbered 8.2 million, 4.5 million, 2.5 million, and 1.8 million respectively in 2007–8. Rodgers and Rodgers (2011) point out that migration played a far bigger role than public employment schemes like the MGNREGA in shaping labour market changes in rural Bihar in recent years. Typically, short-term male migrants work mainly as construction workers in urban areas for a few months of the year, and engage in agricultural activities in their villages for the remaining months. It needs to be investigated whether the Census reported such workers as marginal agricultural labourers (in 2011), while the NSSO registered their occupation as construction work (in 2011–12). This paper examined some important aspects of India’s rural labour market, especially in the first decade of the 2000s, using data from the Census of India and National Sample Survey Organisation (NSSO) surveys. The main findings of the analysis may be summarised as follows. First, the Census and the NSSO are not very different in their estimates of overall work participation rates (WPR) and overall size of the work force, especially with regard to males. However, the number of persons who worked for a major part of the reference year according to Census data was less than the corresponding number according to National Sample Survey (NSS) data, and persons who worked for only short periods numbered more in Census data than in NSS data. A part of the discrepancy is possibly due to differences between the Census and the NSSO in their definitions of the work force. Secondly, the Census finds that the share of male main workers in the population declined between 1991 and 2011, while the corresponding share of male marginal workers increased. There was also a concurrent decline in share of cultivators (main workers) in the population and an increase in the share of agricultural labourers (marginal workers) in the population over these years. These changes were more marked in the 1990s than in the first decade of the 2000s. According to the NSSO surveys, the rate of growth of the work force slowed down and casualisation within the work force increased in India in the 1990s. The NSSO data register a shift of the country’s work force away from agriculture from the middle of the first decade of the 2000s, alongside growing agricultural incomes, more employment through public employment schemes such as the MGNREGA, and rising rural wage rates. At the same time, NSSO data also show that almost half of the incremental non-agricultural employment generated in India in the first decade of the 2000s was in the low-wage sector of construction. Thirdly, there are discrepancies between the Census and the NSSO with respect to the size and growth of the population engaged in agriculture in India. The NSSO data indicate that the size of the work force engaged in agriculture and allied activities declined by 33.3 million after the middle of the decade. On the other hand, the Census data show that the combined size of the work force of cultivators and agricultural workers in the country increased by 29 million between 2001 and 2011. Fourthly, there are wide regional variations with respect to each of the variables described above. WPRs in the western and southern States were substantially higher than the nation-wide average, while WPRs in the eastern and northern States were substantially lower. Both the decline in the size of the work force of cultivators (main workers) and the increase in the size of the work force of agricultural workers (marginal workers) in India between 1991 and 2011, were more pronounced in the eastern, central-eastern, and northern States than in the southern and western States. The Census recorded a relatively fast growth of the work force of agricultural labourers (marginal workers) between 2001 and 2011 in a few States, including Bihar, Odisha, Madhya Pradesh, and Rajasthan. At the same time, in each of these States, the NSSO registered an absolute decline in the size of the work force engaged in agriculture and an increase in rural construction jobs after the middle of the decade. The discrepancies referred to above question the suggestion arising from the NSSO data that the structural shift of the work force away from agriculture in the country – along the lines predicted by Arthur Lewis – might have begun in rural India. They bring into focus the low value addition and the precarious nature of construction jobs created in rural India in recent times (given the possibility that the Census might have counted some workers – who had been identified as construction workers by the NSSO – as agricultural labourers who were marginal workers). At the same time, the discrepancies between estimates from the Census and the NSSO may also reflect some of the problems associated with India’s employment statistics, especially with regard to measuring short-term migration among workers. In East Asia and China, the structural transformation of the rural labour force was aided in no small measure by government intervention. Bramall (2006) attributes the success of China’s rural industrialisation to specific state policies that began to be implemented in the pre-1978 period. At the same time, Bowles et al. (2014) point out how the Chinese government instituted a new set of policies from the first years of the 2000s that were aimed at enhancing rural incomes and reducing rural–urban disparities. In India, there is an urgent need for public investment and specific government policies to enhance agricultural incomes, stimulate rural enterprises, and help create new rural non-agricultural jobs. In the absence of such policies, it is certain that the country will face twin crises in the coming years: of poverty and joblessness in rural areas, and a rising tide of distress migration of rural workers to urban areas. Acknowledgements: We thank two anonymous referees of this journal for useful suggestions, and V. K. Ramachandran for advice and encouragement in pursuing this research. 2 Data obtained from World Development Indicators, World Bank, available at http://data.worldbank.org/indicator/SL.TLF.CACT.NE.ZS, viewed on April 12, 2016. 3 Das Gupta (2010) notes that there has been an improvement in Bihar’s development expenditure since the mid-2000s. 4 See also Appendix Table B2 for the distribution of the work force by various categories across Indian States. Abraham, Vinoj (2009), “Employment Growth in Rural India: Distress Driven?” Economic and Political Weekly, vol. 44, no. 16, pp. 97–104. Bhagat, R.B., and Das, K. C. (2008), “Levels, Trends, and Structure of Work Force in India: Census Based Study 1981–2001,” International Institute for Population Studies, Mumbai. Bowles, Paul, Chang, Hongqin, and Dong, Xiao-yuan (2014), "Rural Economy Outcomes in China After Two Decades of Policy Reform," Review of Agrarian Studies, vol. 4, no. 2, available at http://ras.org.in/rural_economy_outcomes_in_china_after_two_decades_of_policy_reform, viewed on June 2, 2016. Bramall, Chris (2006), The Industrialisation of Rural China, Oxford University Press, New York. Chand, Ramesh, and Srivastava, S. K. (2014), “Changes in the Rural Labour Market and Their Implications for Agriculture,” Economic and Political Weekly, vol. 49, no. 10, pp. 47–54. Chand, Ramesh, Saxena, Raka, and Rana, Simmi (2015), “Estimates and Analysis of Farm Income in India, 1983–84 to 2011–12,” Economic and Political Weekly, vol. 50, no. 22, pp. 139–45. Das Gupta, Chirashree (2010), “Unravelling Bihar’s ‘Growth Miracle’,” Economic and Political Weekly, vol. 45, no. 52, pp. 50–62. Fei, John C. H., and Ranis, Gustav (1975), “A Model of Growth and Employment in the Open Dualistic Economy: The Cases of Korea and Taiwan,” Journal of Development Studies, vol. 11, no. 2, pp. 32–63. Fields, Gary S. (2004), “Dualism in the Labour Market: A Perspective on the Lewis Model after Half a Century,” The Manchester School, vol. 72, no. 6, pp. 724–35. Kasturi, Kannan (2015), “Comparing Census and NSS Data on Employment and Unemployment,” Economic and Political Weekly, vol. 50, no. 22, pp. 16–19. Kumar, Sanjay, and Sharma, N. K. (2002), “Workers in Census 2001: Some Pertinent Issues,” Economic and Political Weekly, May 4, pp. 1712–13a. Lewis, Arthur (1954), “Economic Development with Unlimited Supplies of Labour,” The Manchester School, vol. 22, no. 2, pp. 139–91, May. Li, Hongbin, Li, Lei, Wu, Binzhen, and Xioang, Yanyan (2012), “The End of Cheap Chinese Labour,” Journal of Economic Perspectives, vol. 26, no. 4, pp. 57–74. Mehrotra, Santosh, Parida, Jajati, Sinha, Sharmistha, and Gandhi, Ankita (2014), “Explaining Employment Trends in the Indian Economy: 1993–94 to 2011–12,” Economic and Political Weekly, vol. 49, no. 32, pp. 49–57. National Sample Survey Organisation (NSSO) (2001), Employment and Unemployment Situation in India 1999–2000, Parts I and II, 55th Round (July 1999– June 2000), Report No. 458, National Sample Survey Organisation, Ministry of Statistics and Programme Implementation, Government of India, New Delhi. National Sample Survey Organisation (NSSO) (2010), Migration in India 2007–08, NSS 64th Round (July 2007– June 2008), National Sample Survey Organisation, Ministry of Statistics and Programme Implementation, Government of India, New Delhi. National Sample Survey Organisation (NSSO) (2014), Employment and Unemployment Situation in India 2011–12, 68th Round (July 2011– June 2012), National Sample Survey Organisation, Ministry of Statistics and Programme Implementation, Government of India, New Delhi. Ramachandran, V. K., and Rawal, Vikas (2010), “The Impact of Liberalisation and Globalisation on India’s Agrarian Economy,” Global Labour Journal, vol. 1, no. 1, pp. 56–91. Rawal, Vikas (2013), “Changes in the Distribution of Operational Landholdings in Rural India: A Study of National Sample Survey Data,” Review of Agrarian Studies, vol. 3, no. 2, pp. 73–104. Reddy, A. Amarender (2015), “Growth, Structural Change and Wage Rates in Rural India,” Economic and Political Weekly, vol. 50, no. 2, pp. 56–65. Rodgers, Gerry, and Rodgers, Janine (2011), “Inclusive Development? Migration, Governance and Social Change in Rural Bihar,” Economic and Political Weekly, vol. 46, no. 23, pp. 43–50. Thomas, Jayan Jose (2012), “India’s Labour Market during the 2000s: Surveying the Changes,” Economic and Political Weekly, vol. 48, no. 51, pp. 39–51. Thomas, Jayan Jose (2014), “The Demographic Challenge and Employment Growth in India,” Economic and Political Weekly, vol. 49, no. 6, pp. 15–17. Thomas, Jayan Jose (2015), “India's Labour Market During the 2000s: An Overview,” in Ramaswamy, K. V. (ed. ), Labour, Employment and Economic Growth in India, Cambridge University Press, New Delhi. Usami, Yoshifumi (2011), "A Note on Recent Trends in Wage Rates in Rural India," Review of Agrarian Studies, vol. 1, no. 1, available at http://ras.org.in/a_note_on_recent_trends_in_wage_rates_in_rural_india, viewed on June 2, 2016. Xiaobo, Zhang, Jin, Yang, and Shenglin, Wang (2011), “China has Reached the Lewis Turning Point,” China Economic Review, vol. 22, no. 4, pp. 542–54. India comprises 29 States and 7 Union Territories. In June 2014, the erstwhile State of Andhra Pradesh was bifurcated, leading to the formation of the new (29th) State of Telangana. Since the analysis in this paper covers the period before the bifurcation, data and discussion relating to “Andhra Pradesh” here pertain to the combined States of Andhra Pradesh and Telangana. In the year 2000, three new States – Jharkhand, Uttarakhand, and Chhattisgarh – were carved out of the States of Bihar, Uttar Pradesh, and Madhya Pradesh respectively. Therefore, the pre-2000 data in this paper relating to Bihar, Uttar Pradesh, and Madhya Pradesh are comparable to the post-2000 data for Bihar and Jharkhand combined, Uttar Pradesh and Uttarakhand combined, and Madhya Pradesh and Chhattisgarh combined, respectively. The 28 Indian States (including Andhra Pradesh before bifurcation) and 5 Union Territories that are covered in the analysis in this paper are listed below, categorised under different geographical regions (as defined in this paper). Data relating to the Union territories of Andaman and Nicobar Islands, and Lakshadweep, which are islands with relatively low populations, have not been analysed separately in this paper. Data relating to the States and Union Territories of Arunachal Pradesh, Chandigarh, Delhi, Dadra and Nagar Haveli, Daman and Diu, Mizoram, Nagaland, Puducherry, and Sikkim have been included in the region-wise analysis, but are not presented separately in most of the tables and figures in this paper. The population in each of these States/Union Territories, except Delhi, is less than 2 million. Note: Agrarian conditions are characterised by the share of landless and marginal farmer households in total population and total cultivated land, and the number of cultivators and agricultural labourers per unit of sown area. Marginal farmer households refer to households whose land holdings are less than or equal to 1 hectare. Source: Rawal (2013), Appendix Table D1; Economic Tables, Census of India, 1991 and 2011. Source: Census of India 2011, Economic Tables.